Eid al-Adha is one of the holiest Muslim holidays. 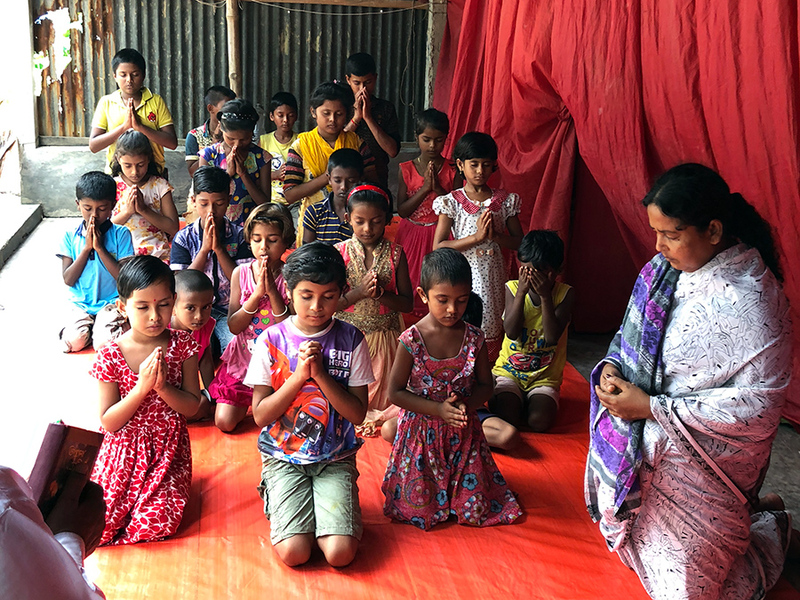 In Bangladesh, the normally jam-packed streets are quiet as the entire country commemorates Ibraham’s (Ahraham’s) willingness to sacrifice his son by gathering with their families, dressing in their best clothes and sacrificing an animal. The only activity in the streets is ritual sacrificing of cows and goats as their blood flows down the roads. But in one small village, children dressed in their finest clothes to learn about Jesus. The pastor spoke of Jesus feeding 5,000 people. The children talked of how God shows His love toward us. It takes courage to meet and publicly speak of Jesus in a Muslim-dominated country. Christians – particularly converts – don’t like to draw attention to themselves and are vulnerable to rampant discrimination. Bangladesh has been troubled with violent militants who seek to establish a caliphate, an Islamic state. They want to purge the land of unbelievers. But these children were eager to learn more about Jesus. Peppered throughout Bangladesh, a network of pastors teach Sunday School classes. The children sit on the ground in rapt attention, and stand to sing joyful songs. On Eid al-Adha last week, while millions of Muslims sacrificed animals, this small group of Christian children celebrated Jesus. You can encourage a Christian child in Bangladesh through a Christian Freedom International sponsorship.